Pamela agreed to let me interview her via email about her journey to the World Figure Championship, and her experiences at that competition. As you will see from her answers, Pamela not only has an extensive technical knowledge of figures, but she also truly appreciates why figures are so important to skating. Fiona: When did you retire from amateur competitive skating? 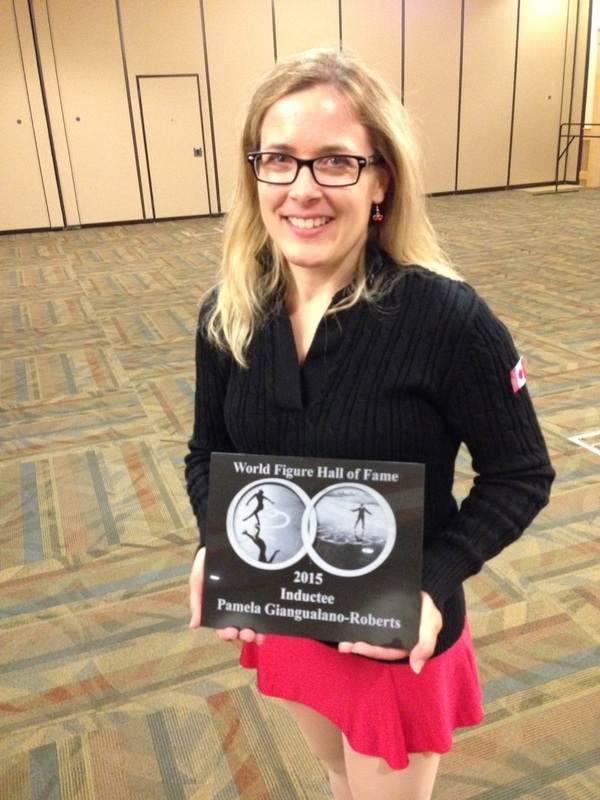 Pamela: I first retired from amateur competitive skating in the summer of 1989, after I competed as a senior at the 1989 Canadian national championships. That championship was the last time figures were skated and judged at a national event in Canada. I competed at nationals from 1982 to 1989, and then again in 2002. My first adult competition was the 2007 International Skating Union adult event in Obertsdorf, Germany, and I’ve been an adult synchro skater since 2011. Fiona: Most of your amateur competitive career was during the time when figures were part of competition. Did you like doing figures then? Pamela: I hated figures in the beginning, because I was terrible at them. In Pre-Novice at the 1980 Northern Ontario Sectionals, I placed 27th out of 33 in figures, won the freeskate, and placed 6th overall. One of the judges had a talk with me and my mom, and said it was time for me to train in southern Ontario during the summer to improve my figures. So that summer I trained with Sheldon Galbraith in Toronto for two weeks, and the next summer, I trained for eight weeks with Dave Matheson in Windsor. It wasn’t until I started training in the summer with Doug Leigh at the Mariposa School of Skating, from 1982 to 1989, that I started to like and understand figures. Starting around the summer of 1985, I was on patch sessions training my figures right next to Brian Orser and Tracey Wainman. This inspired me to work harder and try to be the best. It paid off at the 1986 junior Canadian championships when I won figures! After that, figures became my stronger discipline, allowing me to place well in figures internationally – I was 2nd in figures at the 1986 St. Gervais competition in France, and 3rd in figures at the 1989 Cup of Russia competition in Moscow. From 1985 to 1989, I was training figures four hours a day, Monday through Friday. Fiona: What figure tests did you pass? Pamela: All of them – preliminary to eighth figure. Figures were also part of the competitive singles tests for novice, junior and senior levels. I failed the first figure test seven times! I kept missing my centres on the white ice for the forward outside change (a 3-lobe figure). Fiona: When you came back to amateur competition, figures were no longer required for testing or for competition. Did you notice any differences in competing then, as compared to competing in the figures era? Pamela: Yes, I no longer had at least one hour of figures to “warm up” before freeskate on practice days. I lost flexibility in my back too. It just felt so focused on the triple jumps for competitions. Fiona: When you first got involved in adult skating, did you practice or teach figures? Pamela: I did both. I found that adult skaters who did figures, especially adult skaters that were new to the sport, gained better balance and core strength for edges and turns. That helped them be better at doing the “Skating Skills” patterns, the compulsory dances, and the footwork in their programs. How does one teach a rocker or counter turn for the first time? On a circle, from figures. It made sense to continue to teach figures. Fiona: What made you want to compete in the Lake Placid competition? Pamela: Because I LOVE FIGURES! To me it’s “Yoga on Ice”. The Lake Placid competition was an opportunity to openly show my support for figures, and to take out my old figure blades to skate some figures I had not done in about 25 years. Over the past 15 years, when I practiced figures, I didn’t perform the figures from all of the nine figure tests I had passed. In Lake Placid we had to perform 16 figures from the sixth through eighth figure tests. Also, I wanted to compete in a World event, because I never had a chance to compete at Worlds as a senior competitor. Fiona: How did you prepare for the Lake Placid figures competition? How much time did you spend practicing, and what did you work on? Pamela: First of all, I traced the figures on paper – because off-ice training is just as important as on-ice. I did my paper tracings and started working with my friend and personal trainer Tracey Mah-Gillies to get my body ready. But…there was another reason why I relied on the off-ice at first. At the 2015 Canadian adult skating championships, I injured my right leg in a fall on my butterfly spin – I had a car accident in 2008, and sometimes my right leg and right arm randomly go numb. I still choose to skate knowing it’s a risk, because it’s a sport that keeps me in shape. But I had torn three leg muscles and had a nine-centimetre-long hematoma between two hamstring muscles. I did not take to the ice until the first week in July because I could barely walk until then. Practicing figures was rehab for my injured leg. At first, I had to convert my freeskate blades to figure blades, by shaving off the bottom pick a bit and having the sharpening done at a 1” radius of hollow. Some of my figure practices were simply spent adjusting the alignment of my blades so that I could skate on an outside edge without “steering”. It’s funny, but figures can tell a skater right away whether their blades are properly aligned. I didn’t notice that all this time my freeskate blades had been “off”, and it would have made my double axel entry edge much easier if I had detected this sooner. But I don’t jump doubles or triples anymore, so it’s not a big deal. I spent a lot of time on the four basic figure eights: forward outside, forward inside, backward outside, and backward inside. Then I moved on to the forward change figures and backward change figures. I didn’t do any turns, as I was concentrating on my pushes, changes of edges, and tracings. I wanted to enjoy “riding the edge” – being one with my blade on the ice. Next I tackled all four of the change brackets: right forward outside-inside, left forward outside-inside, right forward inside-outside, left forward inside-outside. I wanted to see the “bunny ears” on my brackets. For outside rockers and inside counters, I tried to make sure the turns were clean, properly shaped and not scraped. At first, the paragraph double threes were a challenge to get all the way around on one foot, but that was much easier with my figure blades. The backward change loops made me dizzy at first. I changed my eyeglass prescription, and then the dizziness was no longer a problem. The backward paragraph loops I practiced on two feet, so that I would ride the edge properly throughout the change of edge – these are the most difficult compulsory figures to perform correctly. I also wanted my figures to “look good” with regards to shape, symmetry and quality of edge. I focused a lot on the “feel” of the edge, rather than trying to “steer” to make the tracing. I documented with photos on Facebook some of my turns and centres, and the six tracings of each figure. When I competed we used to have to do only three tracings of each figure, but for the Lake Placid competition, we had to do six tracings. It was a challenge at first to remember to do six! It was really a test of endurance and consistency. From July until the week before the competition, the last week in August, I skated less than 25 hours. I know it’s not much, but time, money and family responsibilities were factors. I’m a mom of two boys who happen to love skating too. I made the most of my time on the ice. In Lake Placid, for two days, I had almost three hours per day on the black ice before the competition started. Fiona: What kind of support did you get to train and go to Lake Placid? Pamela: I am very grateful and fortunate for my sponsors, friends and family who helped me get to Lake Placid. Three arenas in Calgary donated some ice time: Doug Bruneau with the City of Calgary for ice at the Jimmie Condon and Rose Kohn arenas; Sarah Fitzgerald with the Bowness Community Association for ice at the Bowness Arena;, and Ian Brownlee at Crowfoot Arena. Travel miles and travel points were donated by my husband Cary and my skating friend Tracey Mah-Gillies. Clement Cheung donated a Canada jacket with my initials on it to wear at the event. My parents, James and Berthe, sent me some old skating sweaters to wear. And luckily I was able to locate my old Gold Test figure blades. I had put them on trophies I made in 2006 for the Ice Skating Gala that was hosted by my skating school, Glacier School of Skating. Skating coach Paul Thomas helped me with blade alignment, as he has the magic touch. He was my coach at the 2002 Nationals and I will be forever grateful to him for getting me to try triple-triple combos and improving my triple Lutz. The Glacier School of Skating sponsored me with skate sharpenings, and with putting my sponsors’ names on the back of my Team Canada jacket. I am also very grateful for you, Fiona, for all your online support on Facebook, and the support of my many skating friends who “Liked” and commented on the figures photos I posted. It was inspiring to have “cheerleaders” helping me along the summer training, because some days were tough skating. And the many rink personnel who watched me skate figures all alone on the ice most of the time – they too cheered me on and made sure the ice was just right for me. Fiona: Everyone who’s seen photos of the Lake Placid competition goes “oooh” at the black ice. You mentioned that you had skated figures on black ice before. Pamela: Yes, in 1986 at the Canadian championships in North Bay, Ontario. Doug Leigh’s students were fortunate enough that year to be the very first skaters on the ice after the ice was painted black. One tracing looked like three. By the end of the week, the ice was more grey, but it was still refreshing to see your tracings clearly. Fiona: What was the experience of the Lake Placid figures competition like for you? Pamela: In Lake Placid, the figure competition was a different format than how figures were competed 25 years ago. Each skater had their own patch, and performed four figures within a specified time in front of a referee. There were two groups of ladies for each of the four rounds. The figures for the first round were right forward outside paragraph double threes, left forward inside counter, right forward outside rocker, and left backward outside-inside change loop. I was pleased with my layouts and glad to have nailed the line-up on the loops. I won this round in my group. The figures for the second round were left backward outside paragraph double threes, right forward inside-outside change bracket, left forward outside-inside change bracket, and right backward outside paragraph loop. I was super relieved I skated all six tracings of the paragraph loop on one foot. It was my most challenging figure all summer. It was all guts and trust. I struggled so much with blade alignment on the left foot, and that affected this loop figure more than anything else. In this group I was competing with the top three finishers from both groups from the previous round. My referee, who happened to be a skating coach who taught figures for years, commented on my good form and said that my figures looked good. Unfortunately, the competition ran late so they were not able to “shave” the ice again to “black” for the second day of the competition. The figures for the third round were left forward outside paragraph double threes, right forward inside counter, left forward outside rocker, and right backward outside-inside change loop. This was another great round – my loops were lined up, yay! I won this round in my group, and was within one point of third place overall. The figures for the fourth round were right backward outside paragraph double threes, left forward inside-outside change bracket, right forward outside-inside change bracket, and left backward outside paragraph loop. 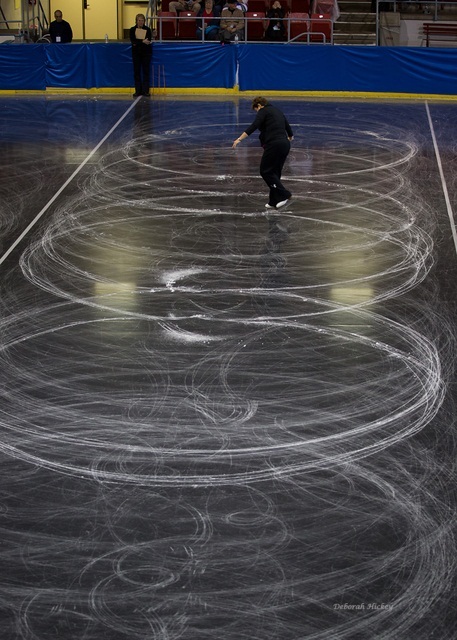 By this round, the “black ice” wasn’t as black, and skaters found it hard to see their tracings. I don’t leave a heavy print on the ice to begin with, which is a good trait, but not when ice conditions are not ideal. I was disappointed that I missed my centre on the first tracing for both change bracket figures, because I literally could not see my tracings among all the tracings from previous patches. I felt I was skating blind. I’m being honest. By the time the left backward outside paragraph loop was performed, my injured leg had had enough. I put my foot down, but I only suffered a minor penalty for that figure. Although a better layout of my figures in that last round would have secured a medal for me, I have to keep it all in perspective. I practiced less than 25 hours, and had to rehab my right leg in a non-traditional way by doing figures. Another great part of the competition experience was wearing my four different outfits. Got to love what you’re wearing in skating! And now I’m ranked 5th in the World at the inaugural World Figure Championship, and was inducted into the World Figure Hall of Fame. What an honour! Fiona: I have to ask….was it nerve-racking having your figures judged by people like Trixi Schuba, Janet Lynn, and Donald Jackson? Pamela: Well, for me it wasn’t. Why? Because the skaters performed their figures in front of their referee on their assigned patch. 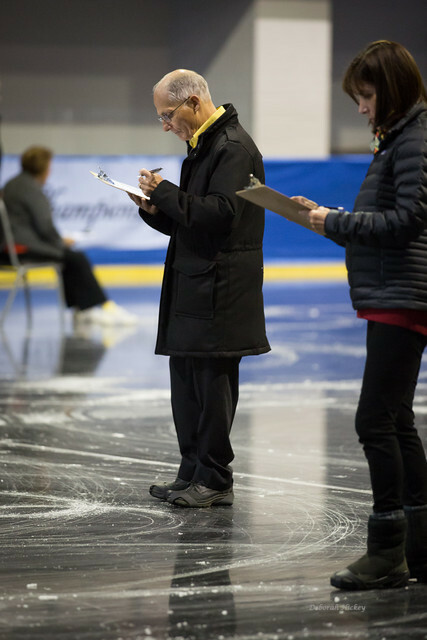 Once the skaters left the ice, the judges came on to judge. They did not know which patch belonged to which skater. It was more nerve-racking having Don Jackson watch me practice on my first practice on the black ice. He introduced me to his wife Barbara and commented that I had good flow on my figures. Janet Lynn told me if I ever needed anything, all I had to do was ask her. Fiona: The dates for next year’s World Figure Championship have already been announced (August 26 & 27, 2016). Are you going to compete in it again? Pamela: I’m planning to. I would like try it again with new blades and new boots. Also, there may be special figures this time in addition to the compulsory figures. I’m told that if the response is great we may need a qualifying competition here in Canada. I’ve also been asked to help forward the “figures movement” by helping skaters and coaches who are part of the World Figure Sport Organization (WFSO). This newly formed organization now governs figures. Fiona: What do you think in general about the role of figures in skating, even though figure tests are no longer required? Skating federations have replaced figures with other test systems that teach edges and turns, but many individuals involved with skating don’t think that those systems teach those skills as well as figures did. Pamela: You nailed it on the head. 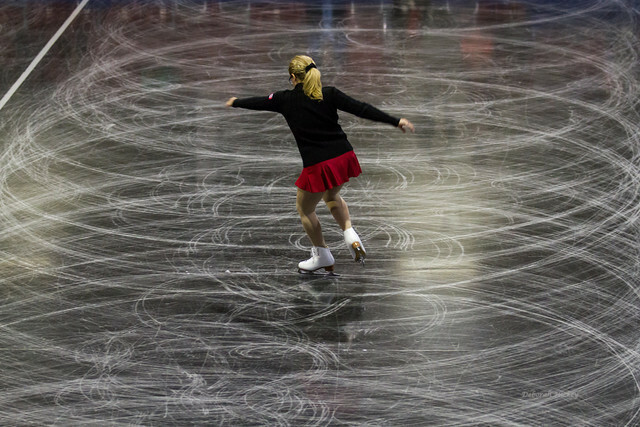 Many coaches feel that the in-between skating and the quality of turns and loops within a footwork sequence have declined. There are generations of skaters and coaches who never learned nor did figures as part of their training. Yet they had to learn the more complex turns like rockers and counters without ever doing them on the compulsory school figure those turns were meant for. For me as a coach, I’ll step this back a bit further. Forget about the complex turns – what about backward crosscuts? How does one “learn” to do them without ever doing a backward outside eight or backward outside edges from the preliminary figure test? Teach skaters the backward outside figure eight and they’ll be able to do backward crosscuts more easily. Why? They learn to transfer their weight to the backward outside edge, which will then allow them to transfer their weight to the other foot. I am talking about very beginner skaters who are learning backward crosscuts, when we make them transfer their weight to the new foot. Figures have applications to many figure skating skills. Figures are the basis of figure skating. The first world championships were only special figures. Free skating came later. 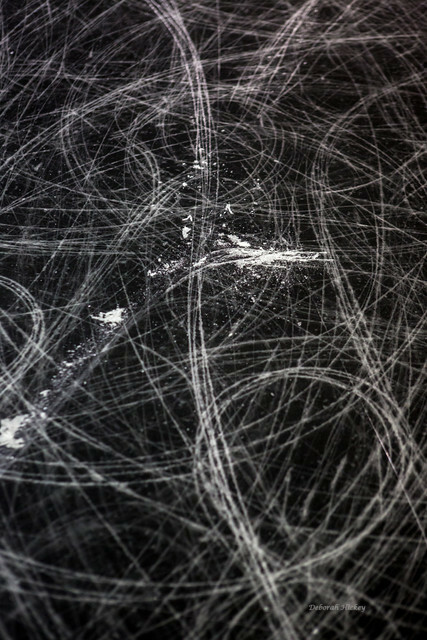 Figures are the threads that bind our print onto the ice. But figures are not only for figure skaters. I’ve seen a young hockey player perform the Maltese Cross in his hockey skates. Figures are simply great training for balance, strength and flexibility. It’s not hard to add training in figures to any skating session. It’s as easy as setting aside 15 minutes or half an hour. Figures are an instant warm-up – something for young skaters in particular to do so as not to get bored. And yet they provide many benefits for all skaters at all levels, even the elite. Off the ice, in our running shoes, we cannot duplicate the forces that act on the body as they do in figure skating. Not only do we have gravity, but centripetal and centrifugal forces are continually acting on the body as we continually adjust and rebalance during figures. A close second to what figures accomplish would be doing yoga on a cruise ship while the ship is at sea during somewhat stormy conditions. And yes, I’ve actually done yoga on a cruise ship at sea! You would never teach someone to play piano without teaching them the scales. They are the foundation for their keyboard skills and understanding of music. Then why are we excluding figures from figure skating? Figures are the foundation for skating skills and for understanding timing. The skater’s knee bend controls not only the timing of 3-turns, brackets, counters, and rockers, but also the timing of changes of edge, loops, swing rolls, choctaws….All around, it’s simply GR82SK8 8’s!